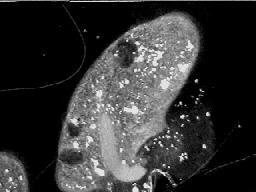 Paramecium Caudatum - Exposed to 1150 Hz - Undergoing Evisceration, Electroporation, and Disintegration, from Plasma Wave. The Sixth International Rife Conference! The Sixth International Conference on the technologies of Dr. Royal Rife will be held September 26-28, 2003 in Seattle, WA., USA. Various lectures, papers, and open discussions on the technologies of Dr. Royal Rife will be the focus of the conference. Last years conference had almost 300 in attendence. Conference information and registration is available at the conference web site. This narrated 115 minute video tape consists of two parts. The first half shows a variety of Protozoan micro organisms being destroyed by the plasma wave originating from the device. This was accomplished without direct connection, through the air, from a distance of about four to five feet. My device is the ONLY instrument in the world that has shown the ability to produce such an effect. The second half of the video shows you in a step by step process how easy it is to actually construct and operate my device. Go to the the end of this document for ordering information. The video tape of micro organism destruction was made entirely with dark field illumination. This method of illumination produces higher resolution and truer color renditions than standard bright field microscopy. A variety of types of destruction of the micro organisms is shown on the video. Some organisms just die, apparently from some sort of metabolic disruption. Another organism shows the effects of internal self digestion apparently from lysosome destruction and release of various digestive enzymes. Most organisms just "blow up" and then disintegrate into extremely small particulate matter. Still photos of this effect are available off the links page. A couple of people have published their tests on micro organisms on the web . The VHS tape is available in both NTSC (Northern Americas' TV i.e. Canada, US, and Mexico) system format, and European PAL formats only! South American PAL and Asian SECAM are not available. This book is about how you can construct for your own use, a modern day recreation of a relatively unknown therapy device. A device first created and tested in the 1930's by Dr. Royal Rife, and then lost to humanity for the next 65 years. Clinical applications and success with Dr. Rife's machine extended through the 1930's, with treatment of a wide variety of diseases. By the mid 1940's, the technology behind Dr. Rife's device was essentially lost, and until recently, was never fully recreated. My book is not the story of how the technological discoveries of Dr. Rife were lost, rather my book - manual is about how you can easily recreate a device that is similar to Dr. Rife's yourself. The many intervening decades from Dr. Rifes' time to our present day has seen the discovery of many new electronic theories and technologies. It was not possible until the past few years to explain how Dr. Rife's instrument functioned. What follows is an explanation of Dr. Rifes instrument that has been learned through research, and the tying together of theories from many different avenues of science. This knowledge has led me to improve on the device, and to obtain patents which protect the unique method and electrical concepts that make my device work.